← Eyes on the Moon! There are some budding space scientists over at Barton Hills Elementary School in Austin, Texas. I was totally impressed by the 2nd and 3rd graders I met there last week! You see, we were talking about how you always see the same side of the moon from the Earth. That’s right, even though the moon spins on its axis while it orbits the Earth, this face is always looking down on us. When you think about it, that’s pretty strange, right? I mean, how come we never see the other side? It’s a puzzler. 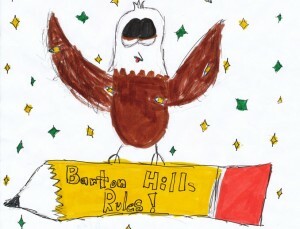 But the kids over at Barton Hills figured it out right away! What’s that? You want to know why. Well, it’s not easy to explain, but–Hey, I have an idea. Maybe the kids at Barton Hills will help me out! I’ll just ask! What about it Barton Hills whiz kids – want to give it a try??? Just click on leave a comment below, chose your space blog nickname (no real names allowed), and help me explain why the same side of the moon always faces Earth. I would really appreciate your help! And I know you can do it, because…. This entry was posted in Earth-Moon System, Space. Bookmark the permalink.